First cut a 5 3/4" x 9" piece of pink card stock and fold it in half for the base, a 4 1/4" x 5 1/2" piece of gray for the middle layer and a 4 1/8" x 5 3/8" piece of white for the front layer. 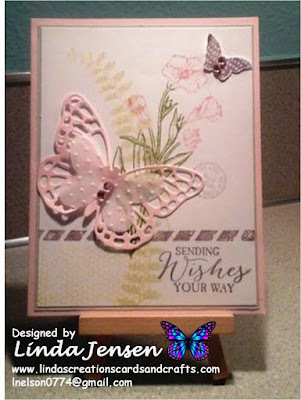 Then cut out the large pink butterfly with a Stampin' Up! Butterfly Thinlits Die and the vellum one with a Butterfly Framelits Die. Dry emboss the vellum butterfly with a Cuttlebug Swiss Dots embossing folder, attach it to the larger butterfly with a mini pop dot, attach the self-adhesive rhinestones, then set them aside. Next stamp the small butterfly in Stampin' Up! Perfect Plum ink, punch it out with a Stampin' Up! Bitty Butterfly Punch, attach the self-adhesive rhinestones and set it aside. Next stamp the yellow mesh background in the lower left corner in Stampin' Up! So Saffron ink, the fern in Stampin' Up! Pear Pizzazz ink with the double-stamping technique (ink the stamp, stamp on scrap paper then your project w/out re-inking), then color the flower stamp with a blender pen and Stampin' Up! Pink Pirouette and Mossy Meadow inks. Then stamp the post mark in Stampin' Up! Smoky Gray ink, then the dashed line and sentiment in Perfect Plum. 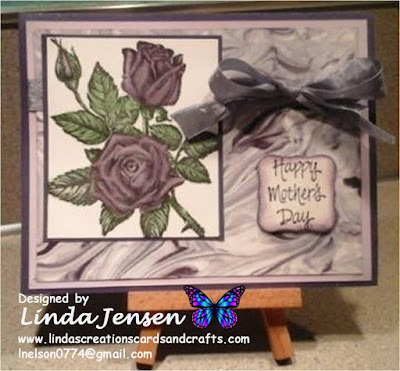 Next attach the butterflies with mini pop dots, attach the front to the middle layer then to the base and enjoy!